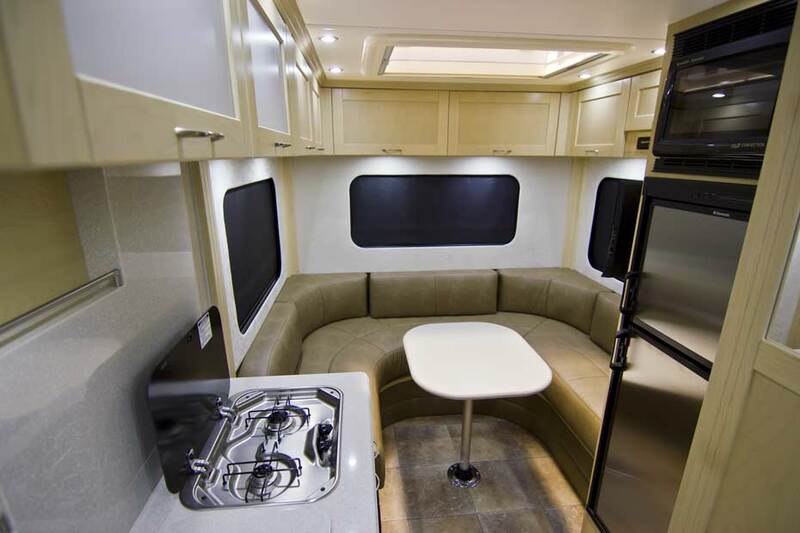 Canadian motorhome builder Pleasure-Way Industries Ltd. has recently announced the launch of the company’s first venture into Class B-plus motorhomes with its new Pleasureway Pursuit. According to the company’s CEO, Dean Rumpel, building a Class B-plus motorhome was a natural progression for the longtime builder. 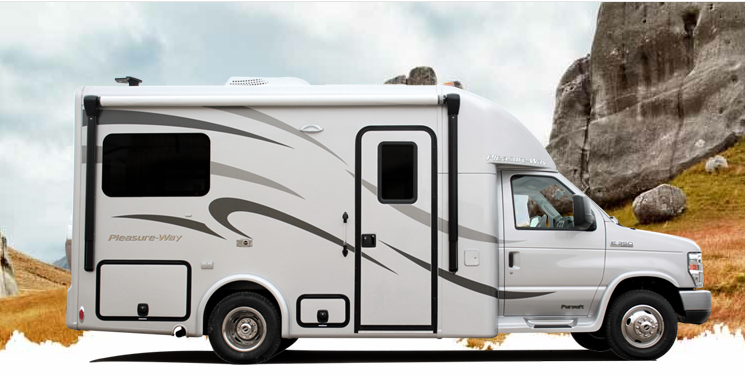 They developed the Pursuit based upon feedback from loyal customers who love their motorhomes but wished Class-B motorhomes could be slightly larger. According to Rumpel, the Pursuit was designed to meet the needs of customers who desire more out of a class-B motorhome but don’t want to move up in class to larger, fuel-guzzling 24-foot motorhomes. The class B-plus Pursuit is built upon the Ford E350 chassis and provides several unique features, one of which being its 22-foot length. However, in addition to added fuel efficiency and space, the Pursuit also offers a beautiful top of the line interior and many features that are not typically included in Class B-plus motorhomes. The Pleasure-Way Pursuit features a full steel cage construction and a seamless fiberglass roof that is assembled in one piece. All of the Pursuit’s fiberglass and steel are directly bonded together, which completely eliminates the need for any additional moldings or screws. The body of the Pursuit is finished off with a high-end exterior paint job that showcases the coach’s elegance and uniqueness. Inside the luxury coach lies an interior full of rich maple hardwood finishes, including the hand-fitted custom crown moldings, fluted molding details, and solid maple cabinet doors. Stepping inside the Pursuit is like stepping inside a high-end Class A motorhome, except it comes with a much lower price tag. In the rear lounge area of the luxurious Pursuit consumers will find rich ultra-leather seating that is filled with three inches of premium memory foam. If that wasn’t enough, the spacious bathroom features a skylight, more maple cabinetry with custom crown moldings, a Corian vanity and backsplash, a curved glass and Corian corner shower, porcelain toilet, and a single lever waterfall faucet that flows into a stainless steel sink. Other standard features that come with every Pursuit include a back-up camera, multiplex wiring, iPod with USB connections, 4kw Onan generator, Clarion in-dash navigation, 13,500 Btu air conditioner, Bluetooth, 32-inch LED TV, and a Blue Ray player with Wi-Fi. When the 6-foot stainless steel double door refrigerator, LED lighting, skylights, power shades, computer workstation, and 12-foot power awning are thrown into the mix, the Pleasure-Way Pursuit is a first-class motorhome that has all of the comforts of home. Upon first glance, the Pleasure-Way Pursuit may seem like a slightly extended standard Class-B motorhome. However, it doesn’t take long to appreciate the luxury details that have been packed into this 15-mile per gallon highway traveler, making it comfortable, fuel-efficient, and easy to drive wherever your heart desires. With so many features, the Pleasure-Way Pursuit is a great choice. It offers great amenities, luxury details, and an easy drive. Traveling in the Pleasure-Way Pursuit will give passengers the wonderful adventure of the open road without letting them miss out on comfort and class. If you’re looking for more information about this great Pleasure-Way model, please don’t hesitate to give us a call at 1-866-975-3287 and speak with a member of our team.